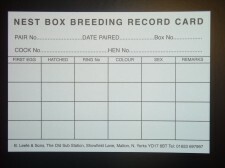 Nest Box Breeding Record Cards/, often attached to the nest boxes to record first egg and ring numbers etc. 6 x 4. Available in packs of 10.